Not the future you need, but the future you deserve. Giant fighting robots to be a reality come August. Jeff Bezos and Lex Luthor have a lot in common: They're both filthy rich, bald, and they both occasionally show up in manned combat robots. That's right. Late in March, Bezos put on his best supervillain face, as he piloted a massive 13-foot-tall robot, the Method II, at an annual invite-only robotics conference organised by Amazon. However, for those of you hoping to see such manned robots in actual combat, Method II won't be doing any fighting anytime soon. With limited mobility and no proof yet of its strength, the Method 2's creators would do well to keep it out of a fight. But that doesn't mean we will be denied the pleasure of watching manned robots square off. In fact, we're going to see it as early as August. Way back in 2015, an American robotics start-up burst onto the scene, courtesy of a very memorable YouTube video. Called Megabots, the uppity robotics firm had two goals – build giant fighting robots, and find other giant fighting robots to go up against. Fresh from building their behemoth Mk: II robot, they looked for a worthy adversary and found it in, you guessed it, Japan. Their challenge was impressive, and their would-be adversaries thought so too. Suidobashi Industries, the maker of the Kuratas, the intended target of Megabots' wrath, responded in the affirmative. But with a rider – only hand-to-hand combat. This stipulation meant it was back to the drawing board for both companies, as they set about modifying their giant fighting robots for hand-to-hand combat. As such, the fight was tentatively scheduled for some time in 2016. And, just like that, a holiday on Independence Day isn't the only thing to look forward to this August. While the final duel may be coming to us a year behind schedule, that doesn't mean that Megabots and Kuratas have been idle during the intervening period. While little is known thus far about the Kuratas, Megabots even started a Kickstarter campaign to juice up their robot. The result is the Mk: III, which towers above their enormous Mk: II robot from the original challenge. 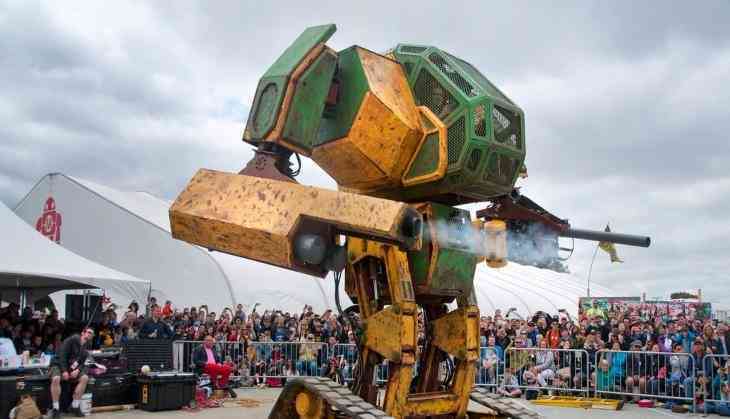 Standing at a monstrous 16-feet-tall and weighing 12-tonnes, Megabots' latest offering is the stuff of sci-fi dreams. Thus far, they've already put giant knives on it and used it to destroy a car. And, of course, shot videos of the same to help you pass time at work. While neither the exact date or venue for the fight have been announced, rest assured that they will be very, very soon. Even better, you won't have to pay to view it as it will available for free on both Megabots and Suidobashi's YouTube channels. If all of that doesn't get you excited for the carnage that's set to be unleashed this August, you just might be a robot yourself.